So I been wanting a new white board in my home office to draw out some ideas and mark up some new things or even leave some messages. I remember having a big white board when I was growing up and it’s aways been really nice. I never even thought about how much a white marker board costs until I started to search for one around town. 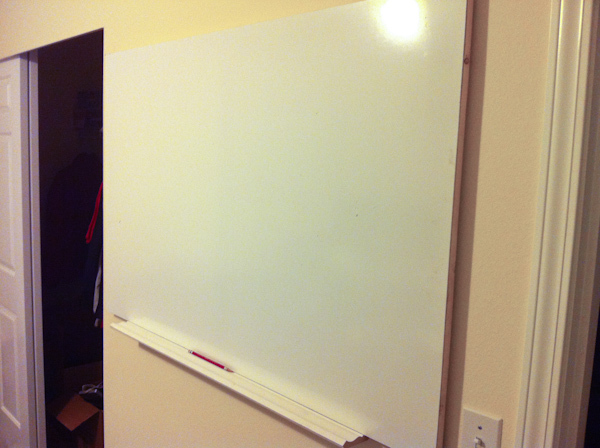 I wanted a 4′ x 3′ white board, however, it cost around $50+ dollars for one. If I drop down to 3’x2′ then it drop down to around 30 dollars (Costco). I really did not want to give up the surface space so I began to look for alternatives. After searching a while, I’ve found couple of websites talking about DIY white board on the cheap. I looked up their methods, and then I went over to Lowes to check out the material and price. i was able to get a 4’x3′ white board surface for only $9.98!!!!! And with that, I am in, I will build my own white board. You are probably wondering well what are you really building anyways? I mean you got a surface, just nail it to the wall. In a way, yeah, you can do that, or you can even just buy white board paint and paint your entire wall to be a white wall like surface. However, I decided to go with either a frame or a hidden frame design. After careful research, I decided to take advantage of left over wood from my home made, bed frame project few months back and use it as a support frame for my white board project. I also decided to a small piece of the left over trim as a pen holder for the whiteboard. The following is my design. The completed whiteboard in my office. 1) I found that gluing the frame on the back of the board was more difficult than I expected with out a clamp. So get a clamp. 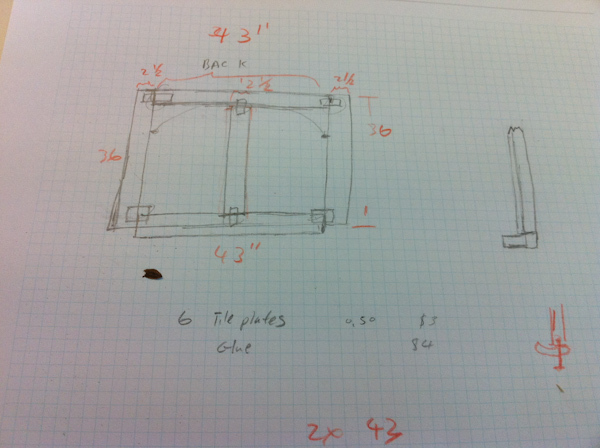 2) I originally designed the board to be 4′ X 3′. 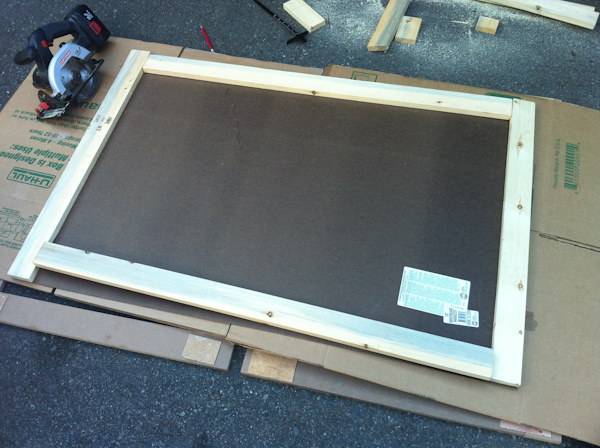 However the board purchased from Lowes states that it is 4×3, but it is 4′ but less than 3′ high (around 2’8″). So I had to reduce my frame size. All in all I was able to make my white board under 20 dollars and in few hours. Let me know in the comments if you have any questions. My Awful Experience with Delta Airlines!!! So this past weekend, I travelled from New York City Airport (JFK) back to Seattle. On the way back I faced few of the most awful costumer services experiences ever and I even found few pieces of glass in my salad. On top of that Delta’s response to my complaint email was shockingly disappointing. So let me tell you about my recent experiences. 1) Rude ticketing and gate agents in JFK. When we arrived, at JFK 2.5 hours before take off, we were hoping to get a companion upgrade for me. Since my girlfriend is a Delta Airlines Platinum Status member and is entitled to a companion upgrade. Not allowing us the upgrade is one thing. But the rude attitude and not knowing their own company policy and in addition, constantly trying to charge me $250 dollars for put me on a standby for upgrade is just plan wrong. Especially, when in the end, when we were onboard the airplane there were two empty first class seats available. So as a result a long email letter was written to the customer service about the situation. After some back and forth verification, Delta’s customer service finally admitted to their mistakes and apologized. They also provided 15000 miles to our frequent flier account each. A simple upgrade or even better customer respect in the beginning would have prevented all of this drama. This was the good response. 2) Your onboard food safety is only worth 3700 sky miles!!! 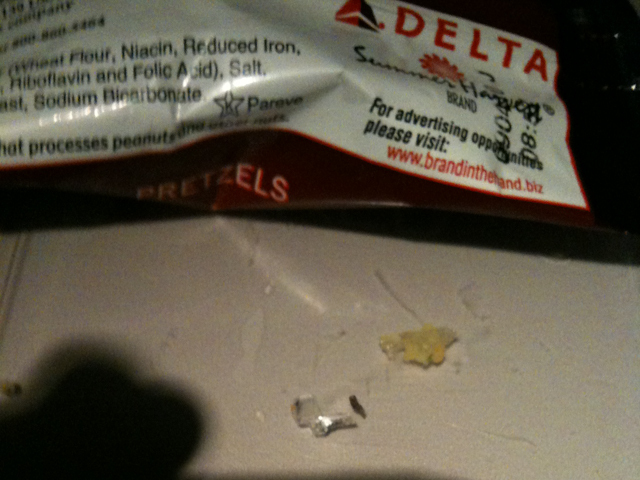 So on the plane back home I found the following pieces of glass in my $8 dollar salad. On the flight when I tell the flight attendant of the situation the response I got was simply… oh we will refund you but tell your complaints to our website. My name is Min-Hsao Chen. I’ve been flying with Delta for over ten years, and my experience with Delta’s services was fairly good until last night. During my flight from JFK to Seattle, I ordered a Southwestern Caesar Salad with Cajun Chicken for $8 for dinner. The salad was tasted kind of bad, but I was hungry. Half way through eating my salad, I ,all the suddenly, bite into something hard. 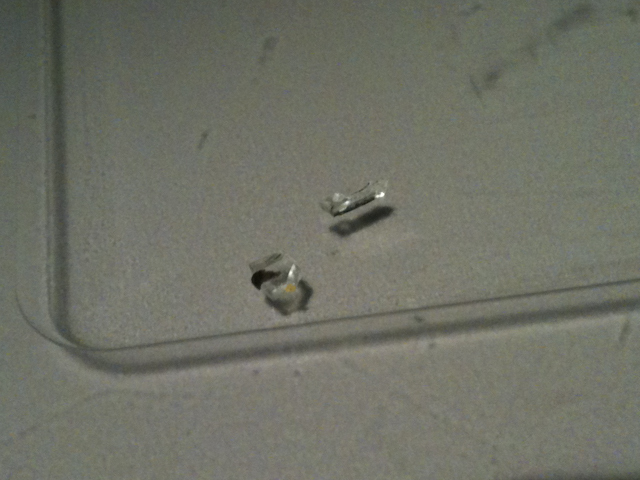 When I spit the mystery item in my hand, it was two pieces of small broken glass. I immediately spit out the rest of the contents in my mouth into the salad container. I think there may have been other pieces in there. You can see a picture of the two pieces that I found in my mouth here. receive was shocking and very disappointing and unsettling. When I notified the Delta flight attendant of what has happened and that I’ve found, she simply said that “oh.. don’t eat that salad anymore and we will refund your money”. Then about 15 minutes later another attendant came by and I told her again of what happened, and she simply stated that they do not prepared the food and I need to complain to the delta.com website. Finally about 20-25 minutes after I notified the attendants, they came by and collected my credit card and refund my 8 dollars. “what can we do to help you?” would have made a world of difference in my impression and my feel of Delta’s culture. 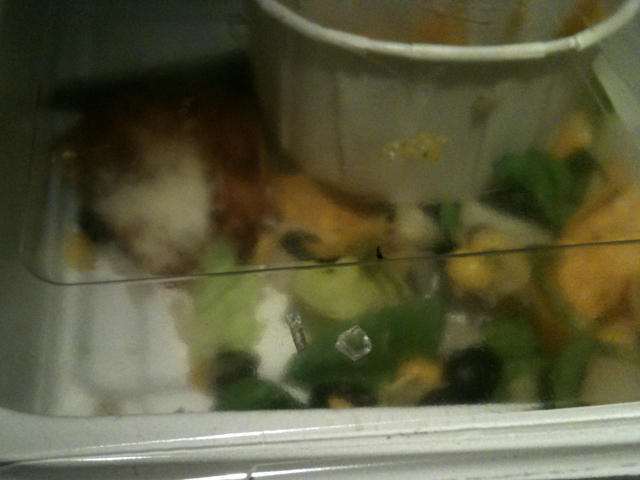 To recap, please check with your food service provider and make sure that there are no more glass pieces in your salads. I do not want anyone else be caught in the same situation as I or even worst if anyone get hurt because of the glass in their food. Second, please re-evaluate your exception handling procedures with your flight attendants. This situation could have been a none issue if the attitude and the actions of the flight attendants were much better. All in all, I think it will be a benefit to the over all public view of Delta Airlines. Thank you for your time and please let me know if you need any additional information regarding my experience and regarding the broken glass in my food. Thanks again for your time and looking forward to hear Delta’s Response. PS. I will be posting this story on my blog and other social networking site. I am hoping to hear a response from Delta. Continue reading My Awful Experience with Delta Airlines!!! So… About 3 years ago, I was in the Fiber to the home world of Ephrata, WA and an idea was developed. My idea was a way to have a P2P distributed file system very similar to Bit Torrent except a virtual drive is created on your computer and then broken up sort of like PAR and RAR files in USENET and spread to all the clients that are peered with each other. This is to take advantage of the fast network and solve our redundant drive backup problem, by sharing spaces with our buddies. My friend Sergeon and I talked about this couple of times and tried to come up with some sort of standard to develope this but was unable to do so. We had many good conversation and good ideas on how to develope this model, however the prototype will never built. Ultimately, we could visualize this idea, but with life and everything else that was going on, we were unable to develope this idea. So today I found Wuala on Slashdot. From the initial read, it seems like it is very similar to my idea. Here is another article on Wuala. The good thing is that someone implemented it, the bad thing is … too bad it was not us.